Telecom-News: In the merger spree, are they lagging on 5G? In the merger spree, are they lagging on 5G? In a bid to come out as third largest telecom operator in US through merger (impending). T-mobile and sprint both have mingled up in their sorting that they seemed to fallen short before their rivals, when the 5G plan of action is talked about during their quarterly result presentation. T-Mobile CEO John Legere told investors during the company's third quarter results conference call that it remains on track to deploy 5G equipment in six of the nation's 10 largest markets by the end of the year. Legere, taking shelter on not mature 3GPP standards on 5G, and tried to down play Verizon 5G commercialization on basis of non standards (proprietary standards) on 5G. Tied to the release this morning of results for its second fiscal quarter of 2018, Sprint said it has installed support for that spectrum band on 70 percent of its larger cell sites. That spectrum is currently supporting the carrier's 4G LTE service, but with pending software upgrades to those towers and the installation of massive multiple-input multiple-output (MIMO) antennas it will be able to support 5G services. Sprint remains on track to commercially launch mobile 5G services in nine markets early next year. 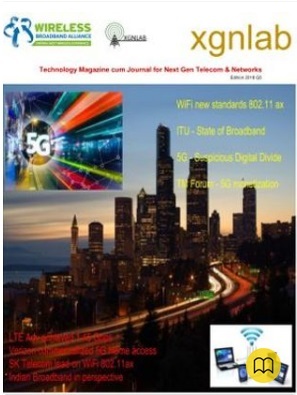 CTO John Saw previously noted that Sprint plans to use around 60 megahertz of its 2.5 GHz spectrum to support those 5G services. Downplaying rivals by stressing the use of 2.5GHz spectrum for better coverage, better than millimeter wave.